03.23.2014: Welcome to our apartment! Independent living is not new to me, but if I could rate my first year of being independent, I would say that I was like a student learning the ins and outs of having to deal with chores on a day to day basis. Coming from a home wherein I would only have to worry about waking up and doing the things that I love to do without worrying about house chores made me appreciate the beauty of being a responsible adult. Anyway, let me share with you our amazing experience during our housewarming week. Late night sausage making, and to make our Friday night even better…we had wine! We love going to Cross Street Market. Went to Fenwick’s for our sausage casings. Since A had to work all day for the weekend, I decided to start on prepping stuff for the party. I was able to do 5 things for the party and cook for the bible study that I attended that night. Just imagine the satisfaction that I felt when I got things done in time! My special request to A…chicken sausage! Bacon and chicken with cheese sausage?? YUMMS! …and sausage making starts now! 6lbs of loukaniko and about 4.5lbs of chicken sausage! I don’t know how we did it but we were able to serve great food for everyone. I was panicking cause A got stuck at work and I know how much he wanted to cook the rest of the stuff, but I had to cook most of it cause guests started arriving. Wine, liquor, cocktail, beer, food and desserts. It was an awesome spread I must say. We finally used the cast iron! 🙂 It has been with A for years and he never used it. So I borrowed it and used for the steak for the quesadillas and burgers! Cause I love Greek food so much!! Our masterpiece for the party. And what’s a party without desserts? Really love how this turned out. I don’t bake fruit flavored cupcakes a lot, but this one I enjoyed making. I added grapefruit zest to the mixture to make it more zesty and fruity. Thanks to Maria for making one of the best cocktails I’ve had! Cause Tory Burch is love!!!!! 1/3 of the people who celebrated with us! Stalking horse to celebrate Maria’s birthday!! 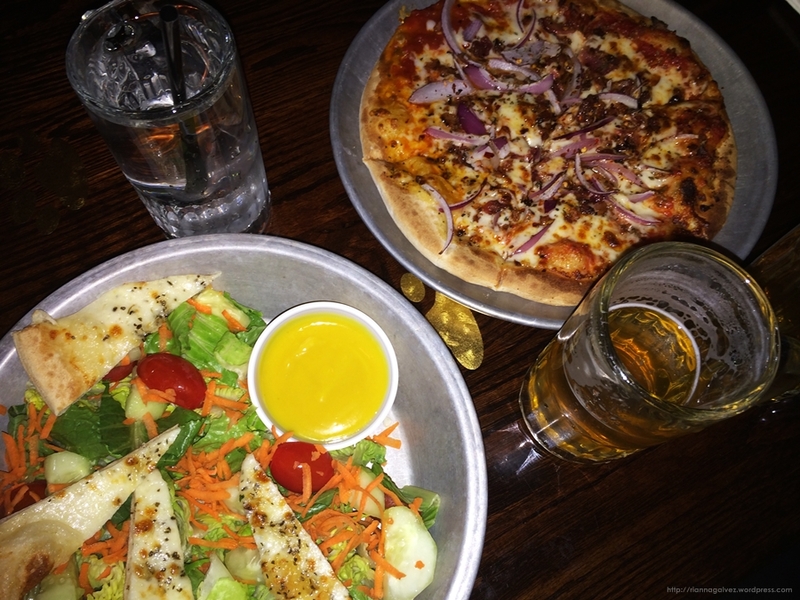 …and since A can’t stand the crazy wild crowd, went to Pub Dog which was next door for some late night grub!